I arrived in the UK in 1996 and got a somewhat technical job. Within 9 months of getting that job, I landed a job with a proper IT company and continued my nefarious online marketing career, learning about packets, TCP/IP, DNS and BIND, and all the domaining internet could teach me. Once spamming became too much like hard work for me, I got a real job in the real world. What working in publishing for a publication that reports news does to you is patches into your very DNA something most people believe in anyway – freedom of expression within the law and freedom of press. Going to jail to protect your source is lauded by your editor and colleagues. Writing about the truth is important no matter what the cost. When three gunmen threatened a mother and her daughter unless she let them into the Charlie Hebdo building, they tried to violently end that freedom of expression. When they began shooting journalists, editors, a maintenance worker and a visitor, they were trying to control the freedom of the press. All those gunmen did in the Charlie Hebdo offices was to remind us of those things which are precious in life. Those things which are denied to many: freedom of thought, freedom of expression, freedom of speech and just all around freedom. Imagine if that was your daughter with a Kalashnikov pointed at her as the gunmen demanded to be let in on pain of not only her death but that of your granddaughter. Imagine if that was your brother who had been gunned down for no other reason than wanting to be a journalist. What if that was your father who had been violently killed for no other reason than working to fix something in the offices of a publication. While it doesn’t bear thinking about, these gunmen have forced us to think about it. Having been born to parents in Canada and living in the UK I have been mercifully free to believe what I want, even if that means believing in the Flying Spaghetti Monster. Being in the UK means I can vote for the Monster Raving Looney Party if I choose to. Being free means I can have a blog and as long as I stay on the right side of the law I can post what I want to. I am a woman and I am free. I hope that everyone in and out of publishing stands defiant in the face of these gunmen. I hope that the freedom of speech won in blood decades ago, continues despite it being paid for in blood again. I hope that the price of freedom of the press is never too high. I hope that editors enable their staff to question, challenge and test free from fear. I hope that I do not live to see the day when our free press is lost to terror and fear of reprisals. I will remain free and I will write what I believe. I will remain free and defiant in the face of violence. 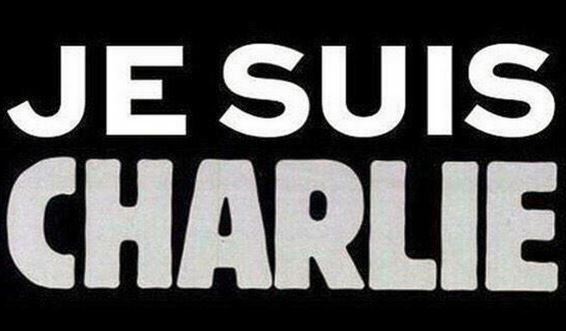 I will honour those who have paid for my freedom in blood because – Je Suis Charlie. I honestly couldn’t agree more with this! Ghastly news yesterday and so vicious. I hope they catch who did it soon. I think the biggest tragedy is that is has made people afraid to write freely. People were saying that papers would no reprint the cartoon because they were afraid of similar things happening and in that one statement we see the freedom of the press being eroded. Not printing something out of fear. It’s extremely sad. Very well said Judith. This came as such a shock and is absolutely not something we should tolerate in our society. Freedom of expression was hard won over a very long time, as you pointed out. Thanks Choclette – The reason that we can agree or disagree with something publicly is because of freedom of expression and press. Think about the blogger who was sued for writing a negative review of the restaurant in France, the journalists jailed for refusing to reveal their sources for a story, and so many other examples of where freedom of speech has been threatened. We are privileged to be able to blog and when people try and stop our freedom of speech whether by a court case or slaughter, we should hold on to our freedom all the tighter!